← Colten Finds a Foot! Lots of randomness in this post. Bear with us! I was perusing some spina bifida related videos on YouTube today and Children’s Hospital of Philidelphia has a wonderful 12-part series about Spina Bifida, from diagnosis to surgery and beyond. This specific one is one of the best descriptive videos about what Spina Bifida is and if you have a few minutes, we would love to have you watch it! It does a great job of highlighting what SB is and some of the complications that go with it. Update on Colten finding his feet… He still seems a bit disinterested. We play with them a lot, he wears crazy socks with rattles, we put them in his mouth. Every once in a while he acts like he is intentionally grabbing at his leg or foot and he engages for a second or two then goes about his business. Most of Colten’s interests still lie in people’s faces instead of toys. We are always trying to encourage more interaction with various toys and books – but it’s hard to resist a kid who just wants took at you and grab at your face! How can you resist these eyes?! A huge thank you to a family friend, Mindy, for hooking us up with her activity center. Because we are being discouraged from using bouncy activity centers with Colten (could have a negative impact on the treadmill stepping, although at this point, that can’t get much worse! ), I went looking for one that would work better for him. I found one that has the activity station in the center and the child sits in a sidecar-like seat that moves around the outside of the station. I asked the U of M study team if this would be a good fit and they were excited about it. Because kids with myelomeningocele tend to have weak abductors, and the seat requires a side-step motion to move, if Colten can do this motion it will be a great workout for him. Actually, if the child can pivot themselves in the seat, forward and backward walking can be done too. Anyhow, Mindy and her family graciously passed on their activity station to us so Colten can use it! He loves being upright already in it, but cannot touch the ground so he’s not in it very long as this position isn’t ideal for hip/spine growth – he needs to be more supported instead of dangling from his crotch. 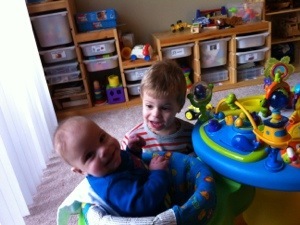 However, Max has quickly realized he can push Colten around and around and around and around. I think they both had fun! The crew from the University of Michigan Developmental Neuromotor Control Laboratory was here on Friday. This is the group running the treadmill study Colten is a part of. They come by every two weeks to measure and do practice sessions with Colten. Richard handles most of the treadmill stuff now. He hasn’t been having much luck with Colten taking many steps on the treadmill, and that was very much confirmed on Friday. He didn’t take any alternating steps, only some single-steps. The point of the study, however, is not to get Colten to walk, but to step in order to have impact/compression through his legs. This will help build up stronger bones for him which will hopefully result in less fractures in his future. However, if he’s not stepping…then I’m not sure how much benefit we will see. So Richard will continue to do treadmill time each day and hopefully he’ll get past this non-stepping slump soon. 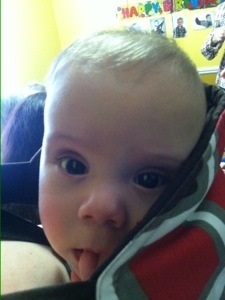 One of the things that both the treadmill folks and the PT would like Colten to have more of is tummy time. This has been a hard thing for us to do much of for a couple reasons. One is that there seems to be some mixed information on tummy time. I saw this video a few years ago, after Parker was already rolling around. I recall thinking I would be interested in trying this route with our next child – allowing the child to naturally get onto their belly instead of pushing tummy time. Sure enough, when Max came along we didn’t push tummy time, but he progressed so fast that he rolled both back-to-belly and belly-to-back by four months! So we have not pushed it with Colten. We prefer to let him learn how to do it on his own. This is actually in line with the Anat Baniel Method therapy we take him to. Don’t force a development schedule on the child – let the child learn and develop in his/her own time. As I recalled the video and looked it up, (this is what started my YouTube-ing today), I discovered that the philosophy behind this video is based on the Feldenkrais method. That meant nothing to me at first, but as I watched the video again, there seemed to be so many correlations between what this research was saying and what the Anat Baniel Method teaches. So I dug a bit. Sure enough, Anat Baniel studied under and was trained personally by Dr. Moshe Feldenkrais! So maybe it’s a sign that this therapy is what we’re suppose to be doing. The philosophy feels right for us, Colten enjoys it, and it’s not so much a therapy as an educational model for his body and brain. Right now Colten is 5.5 months. He should be rolling side-to-side more – he was doing it quite a bit before, but that seems to be because he disliked even being on his back (can you blame him?! I wouldn’t want to lay on a surgical site!). Now that he is comfy playing on his back, he doesn’t apparently feel the need to roll side to side anymore, except when he’s tired and in bed. Then he rolls right over and cozies up on his left side. He seems to shy away from rolling onto the shunt side much. 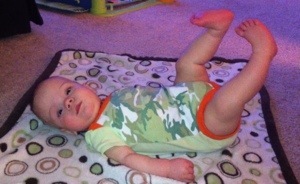 Here’s Colten enjoying back time – his legs up in the air always crack me up! That’s his “relaxed” pose! This entry was tagged Anat Baniel Method, myelomeningocele, physical therapy, spina bifida, Treadmill study. Bookmark the permalink. What an inspiration the video with the little girl is for all Spina Bifida patients! You and Richard are an inspiration for all you are doing to help Colten be the best he can be as he grows. Thanks for this update. I love the part about Max spinning Colten around. Great photo. Max looks like he’s having as much fun as his younger brother! Nice video on Abigail. So many stories of children with disabilities facing them with courage, inventiveness, and matter-of-factness. You folks are doing such a terrific job of caring. I think the whole “tummy time” thing is a reaction to the “sleep on the back” thing. Babies who are slung a good part of the time get all the “tummy time” they need.!!!!! I agree Kip! And bring worn helps back development, reduces hip displaysia, strengthens neck, and prevents the flat headedness.